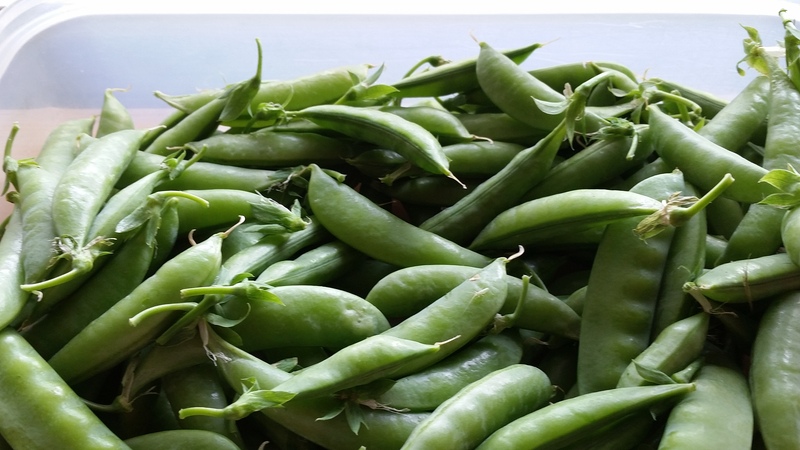 It is the season for sugar snap peas (Pisum sativum var. macrocarpon), and we have had a wonderful harvest of sugar snaps in our yard, and we expect more from Restoration Farm, our CSA. 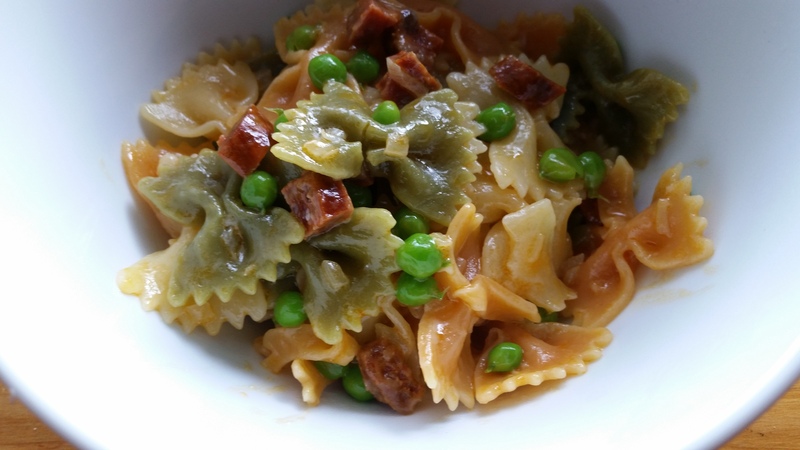 So today I made a special sweet pea dish — Pasta with Chorizo and Peas – for my seven-year-old swee’pea who is in charge of peas at home, from planting to watering to harvesting (he gets assistance in stringing the poles as our peas need strings to climb on with their delicate tendrils. We buy sugar snap seeds from Botanical Interests). Someone eats a lot of peas as he is harvesting. Someone’s mother doesn’t mind at all. He collected peas between World Cup matches today and then we spent a companionable half hour shelling the peas and eating many of them as we watched Costa Rica play Greece in the World Cup and I put the water to boil. At halftime I made dinner to eat during the second half. Quite a haul! We can freeze what we don’t use. But we’ll use it all before that happens. So the following Pasta with Chorizo and Peas is a new recipe and below that you’ll find links to some of our perennial favorites: Spanish tortillas and Italian pastas. 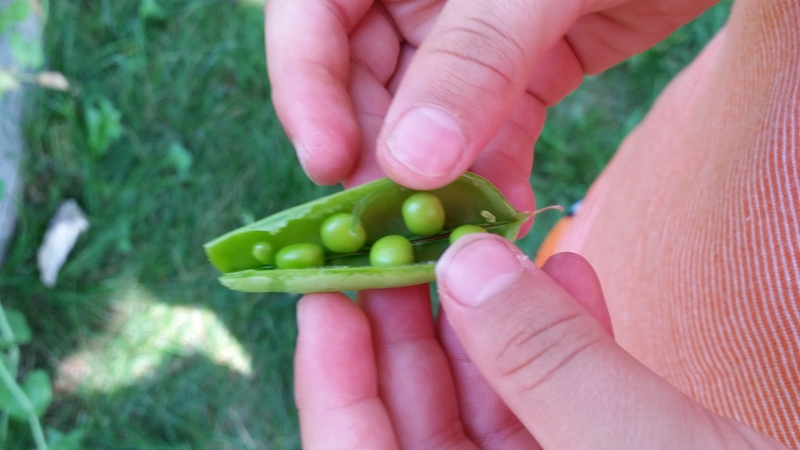 This recipe uses only the peas, but the pods are edible. 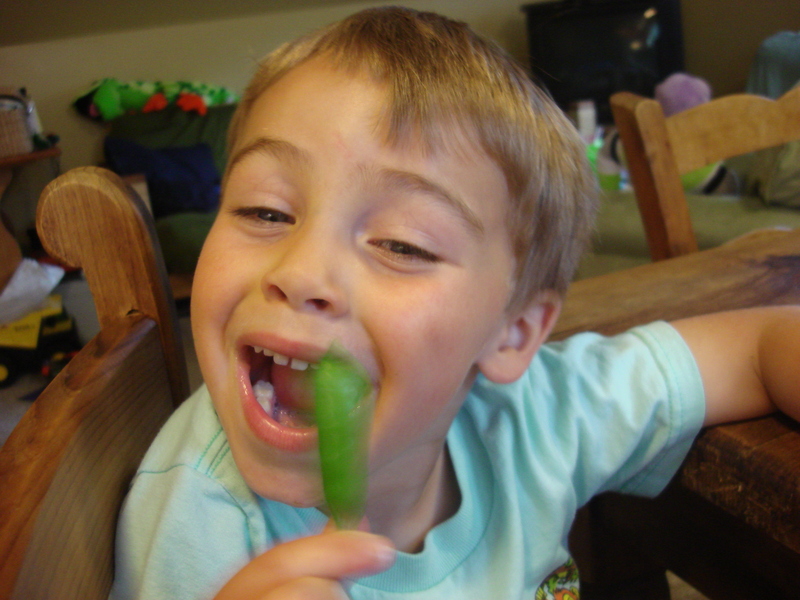 I sliced the pea pods into my salad, as he doesn’t like those and I find them wonderfully crunchy and sweet. Rich flavor that doesn’t overwhelm the peas. 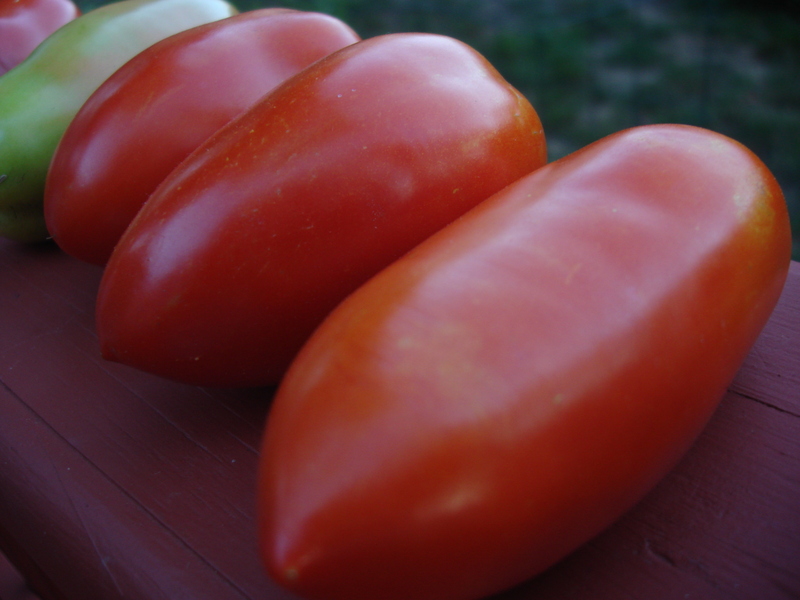 400th Post – A celebration because YES, I have ripe tomatoes! This is my 400th post, which seems to be quite a lot. It’s funny how much energy you can manage to put into the things you love. Even when you don’t have any energy to spare. 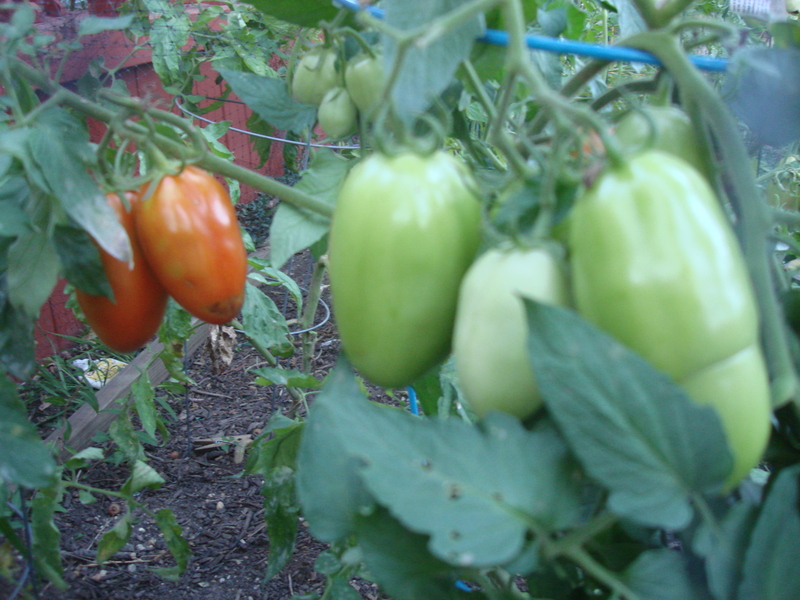 So I am not going to say much, just show you my paste tomatoes, which are lighting up a summer that was otherwise dark with failed crops…. And more to come…provided we keep a few steps ahead of the blight! 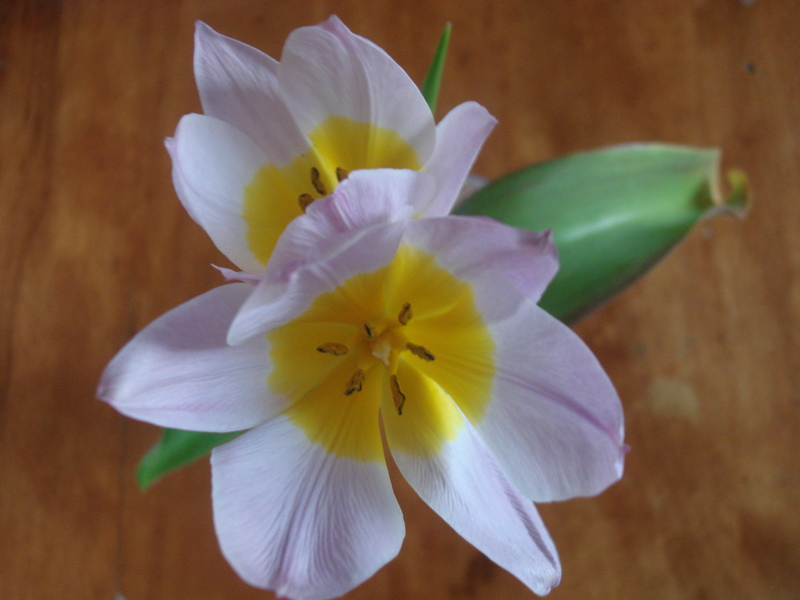 Thanks to all of you for your visits and comments, It is terrific to know that there are so many kindred spirits out there gardening, cooking, eating….I would love it if you would take a moment to tell me what some of your favorite posts or recipes are! At Least We’ve Got Some Beautiful Garlic…. Our vegetable garden has been fairly catastrophic this year. 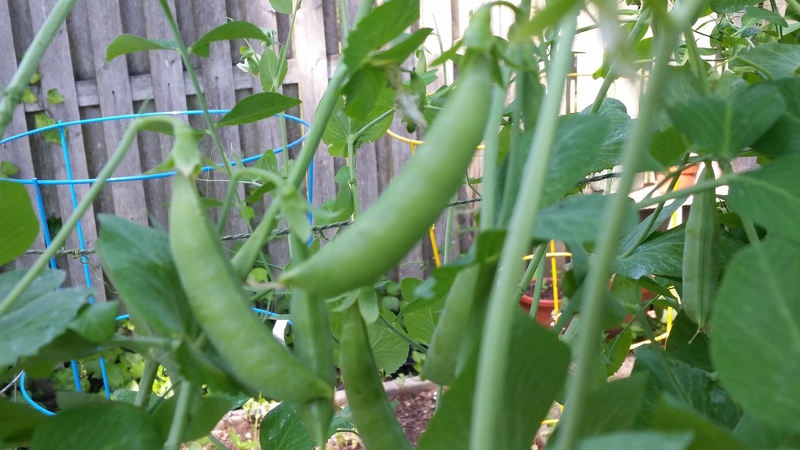 Aside from a decent harvest of peas and some nice lettuces, much of what we have planted has been eaten by critters, rotted by excessive rain, wilted by excessive heat, or inexplicably stunted. The radishes never took off, the broccoli hasn’t produced a single floret, the eggplant looks like an bad bonsai experiment — utterly lacking in buds to boot — even the basil has been chewed to a lace and ribs, and do you know ANYONE who can plant zucchini two years in a row and only have ONE, that’s right, ONE SINGLE SOLITARY, zucchini to show for it? That’s just pitiful. Well, I could go on, but that might jinx the tomatoes, which actually look quite good, except I think my watering has not been consistent and there could be some blossom end rot in my future. 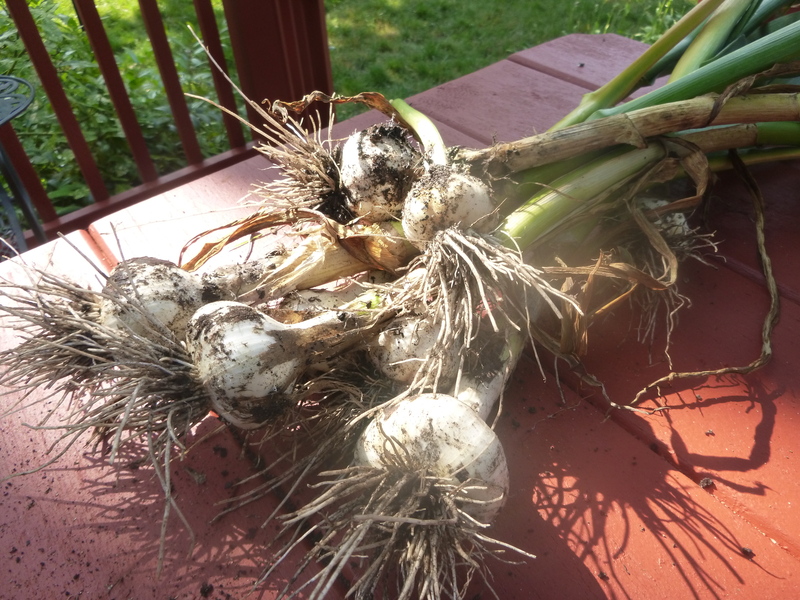 So, I will look on the bright side and say that not only did our garlic produce lovely scapes earlier in the season, but we are also drying a healthy bunch of our own garlic bulbs, planted last October in our raised beds from a head that I reserved from Restoration Farm last season. Accentuate the positive…our homegrown organic garlic is beautiful and heady with fragrance. My friend Vic Muñoz calls them terrestrial jellyfish for their look! So, no recipe today. Just a deep breath, thanking goodness that I am not depending on my crop to feed my family. A celebration of what has gone right. And a resolution to keep trying. Because knowing how to grow your own food is important and because perseverance is important and because everything takes time to master. 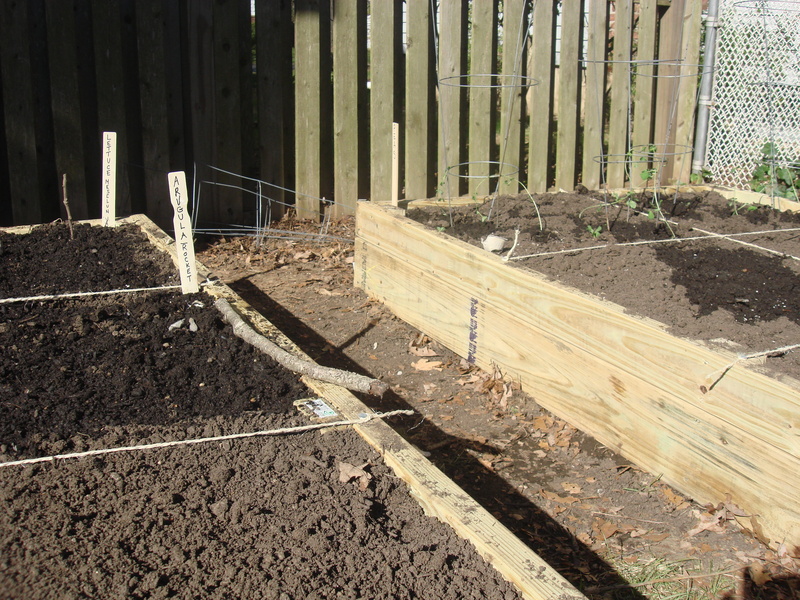 Wish me luck with the fall vegetables, some of which are already planted…. As we get into the planting season, several people have asked me where I get my seeds. 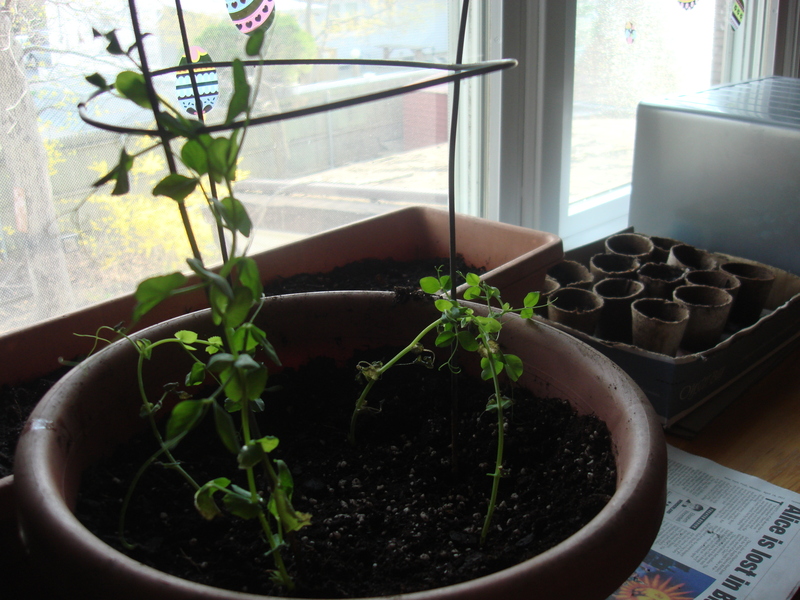 The answer is, from several sources (not all organic, as it happens, with my Puerto Rican herbs and peppers): the local garden supply stores like Hicks or Starkie Brothers, giveaways at foodie events, friends who send, seeds I’ve saved from our own garden or from the C.S.A. box. Click on the radishes for Botanical Interests. Click here for High Mowing Seeds. Click here for Johnny’s Seeds. 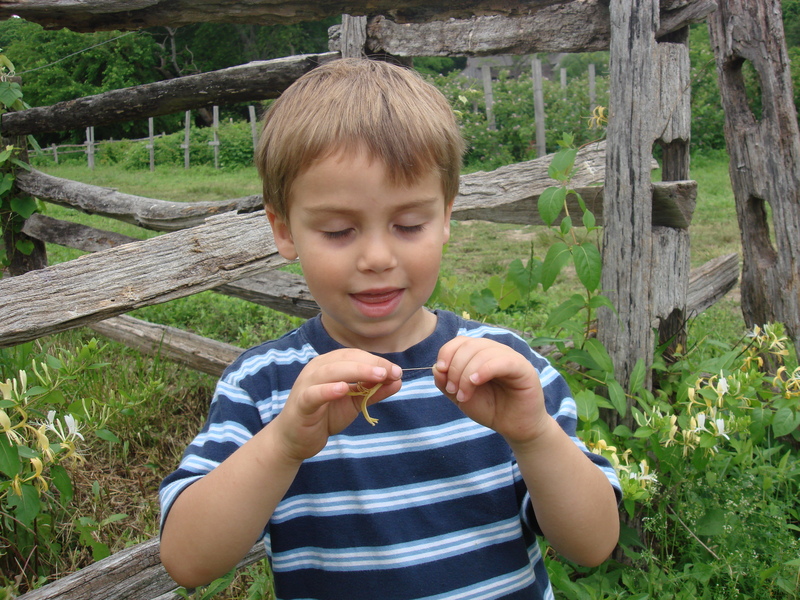 So, I’m putting it out there…what are your most reliable and/or beloved seed sources and why? Please click on Comments at the bottom of the post to add your spoonful of wisdom. We are eating from the garden! 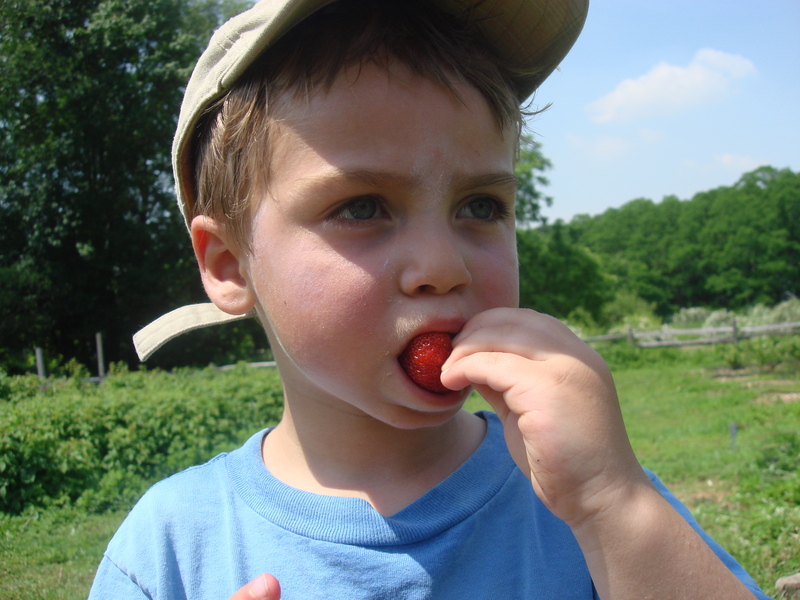 We are eating from the garden! 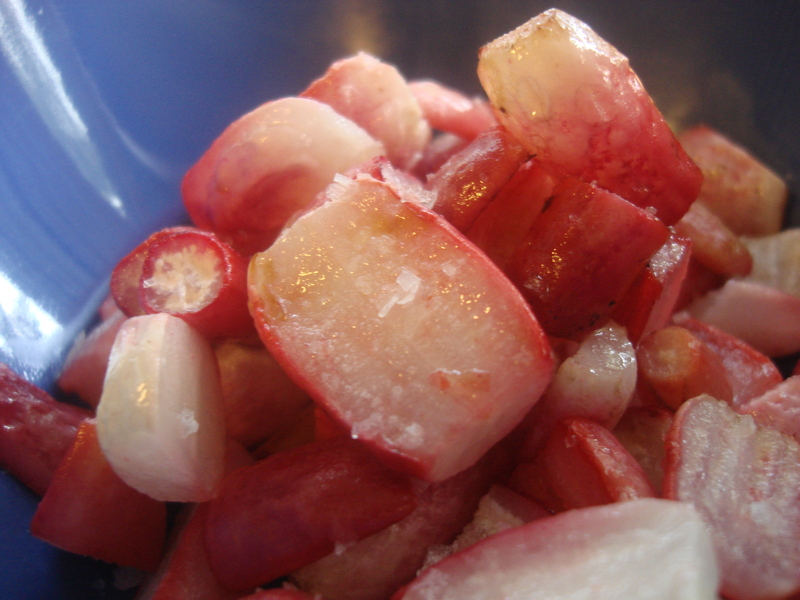 I cannot tell you how pleased we are with the French Breakfast radishes. 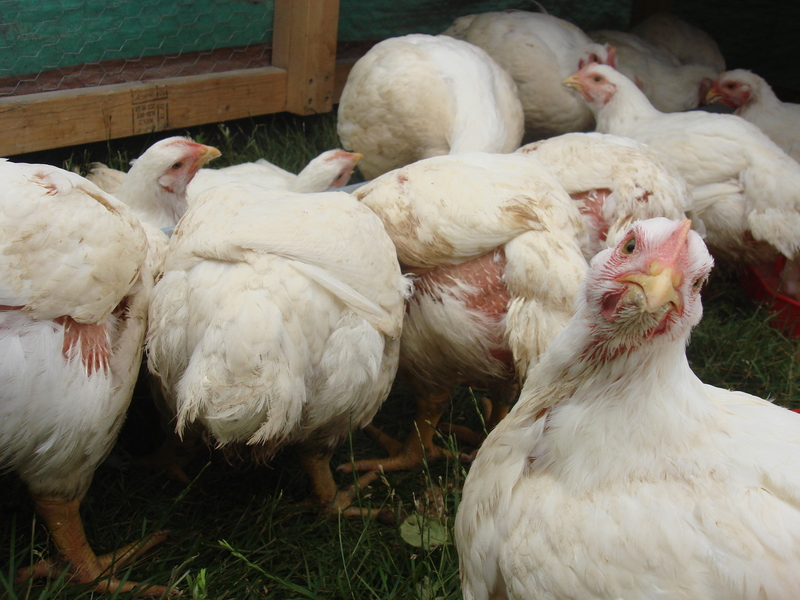 No, we are not eating them for breakfast. No, we do not have any desire to suddenly become French (although a pied a terre in Paris or a cottage in the South of France would be very nice, thank you). But the French Breakfast radishes? This little piggy said “Oui, oui, oui!” all the way home. 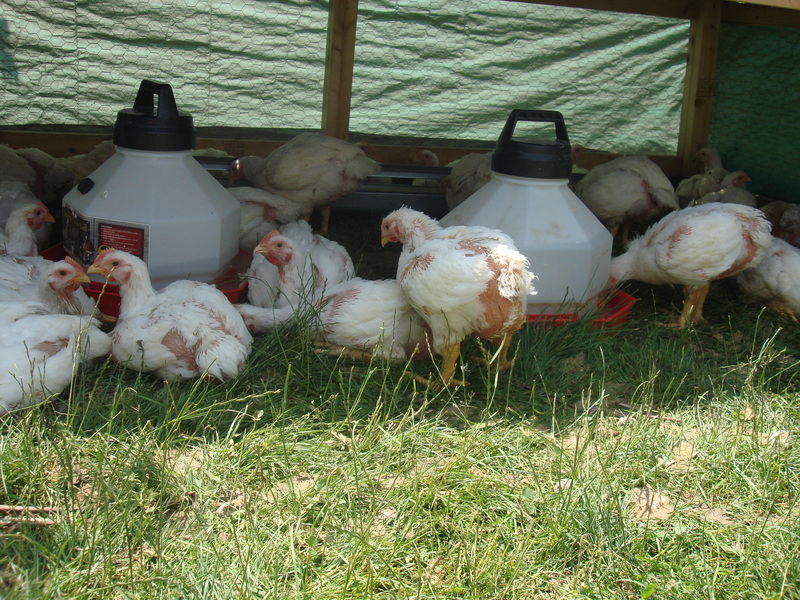 They are the easiest thing ever to plant and grow, don’t mind being crowded, move fast (like less than four weeks to edibility) and are easy for a preschooler with no patience and limited fine motor skills to harvest. 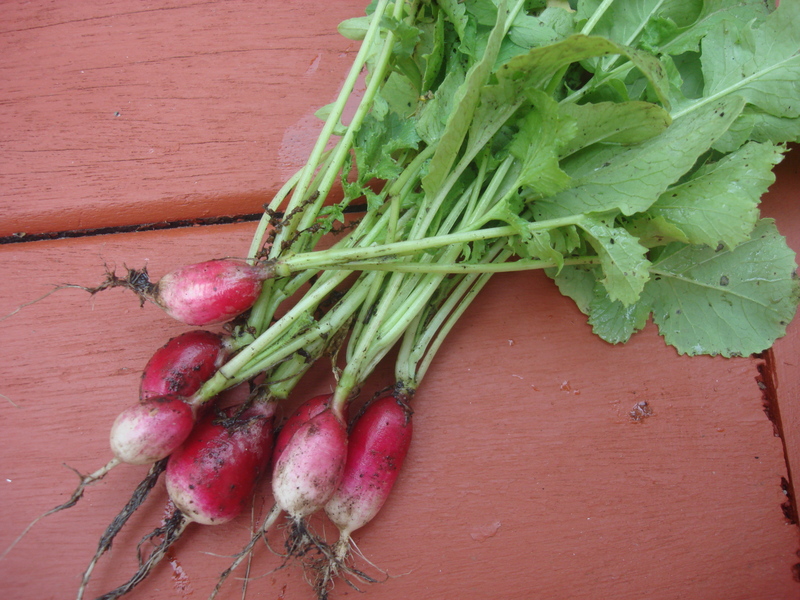 Because we are pulling them out of the ground, and not out of a little plastic pouch, we also get the radish greens, so today’s blog is a double feature. You can use the whole thing (well, I do cut off the stringy rooty bit)! 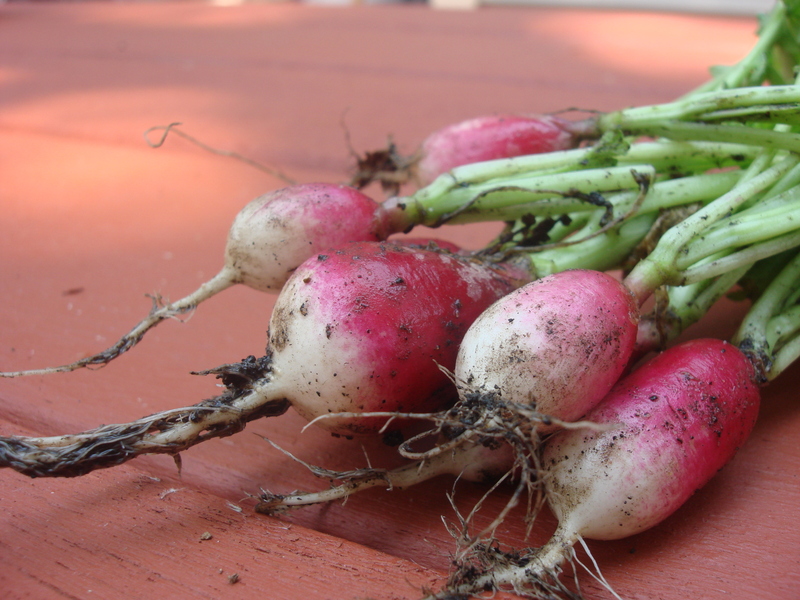 Let me just move on from that one and say, if you are willing to deal with the dirt (you may want to hose them down over the garden bed so you don’t lose all that good soil), the freshness of these radishes is amazing. And the sweetness that comes out in roasting is astonishing. The greens are great too, in the way that all leafy greens are great (to me). Saute with garlic and love them up. So here are your two recipes for the the same veg. Rock on! 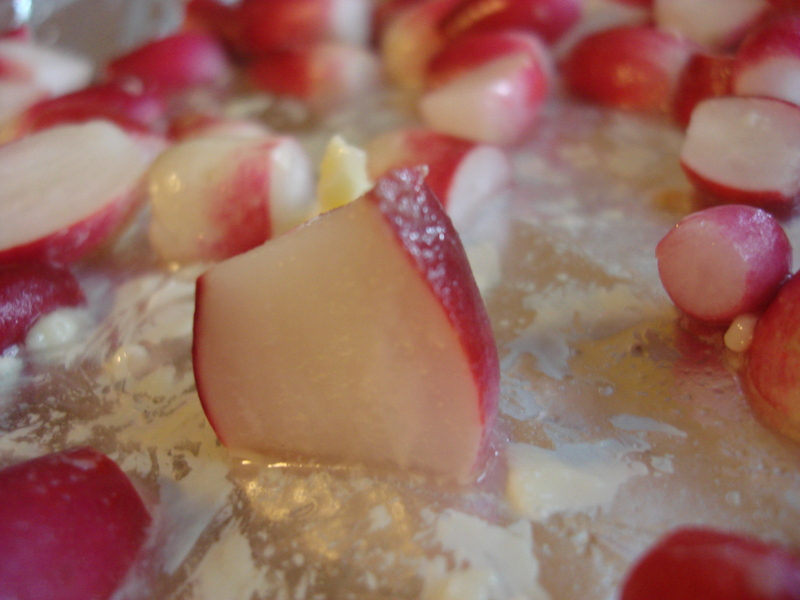 Place radishes on a rimmed baking dish (lined with foil if you prefer). Smother with remaining ingredients and roast for 15-20 minutes or until browning at the edges. Sprinkle with additional salt, if desired. Serve. Heat olive oil in sauté pan at medium high until liquid and fragrant. Add garlic, lower heat and cook for one minute or longer – until lightly golden. Add radish greens and stir to coat. 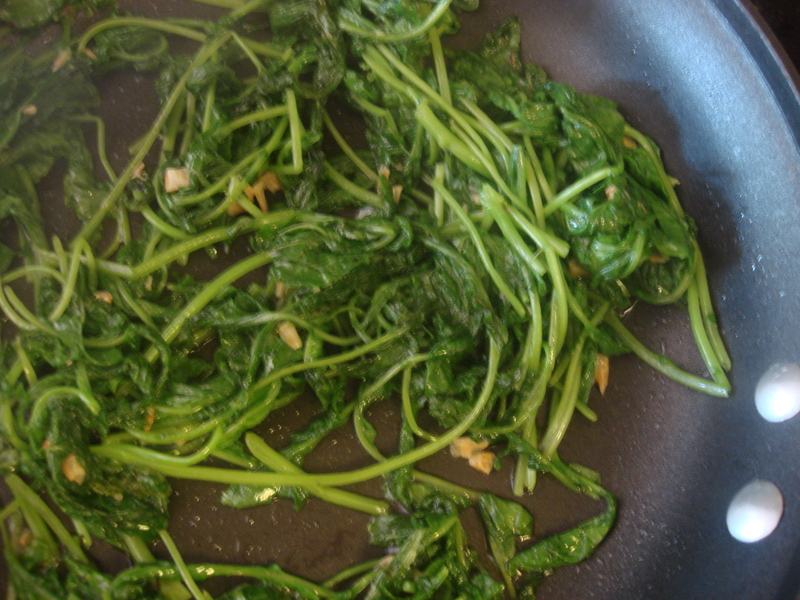 Cook at medium heat until bright green and wilted. Serve on its own, or as an addition to a sandwich. I attended the Small Farm Summit 2012 at Hofstra University (that’s Hofstra, not Adelphi University, which campus I drove around in error and confusion and dismay followed by self-recrimination and self-flagellation, until I realized I was only about ten minutes from Hofstra anyway – thank you GPS – and settled back to enjoy driving through how the other half – the folks who work and study at private universities — lives. Wow, that is definitely not the cement block public university horror architecture I am so intimately familiar with in my other life as a lecturer. They’ve got rolling landscapes, trees, stately brick buildings, lush landscaping…but I am meandering around the way things aren’t; let me get back to business). The Summit was so inspiring – especially for someone like me, who is looking at her son entering kindergarten with some trepidation, not because he is not ready or I am not ready — we are ready. It’s because I’m afraid of what he’s going to eat! School lunches are notoriously unhealthy, and food “choices” are kind of laughable, unless you think that your divine right to tater tots and a bagel every day constitutes freedom of choice for the consumer. Or a five-year-old. Oh yeah, and now that he’s leaving our beloved Greenhouse, nobody’s going to be reheating lovingly homemade foods for H.R.H. Leandro, Prince of My Heart at lunchtime. How am I going make sure he gets healthy hot meals in the dead of winter? Yikes. Caroline, Ava and Kobe (my spellings are probably wrong - apologies!!!) 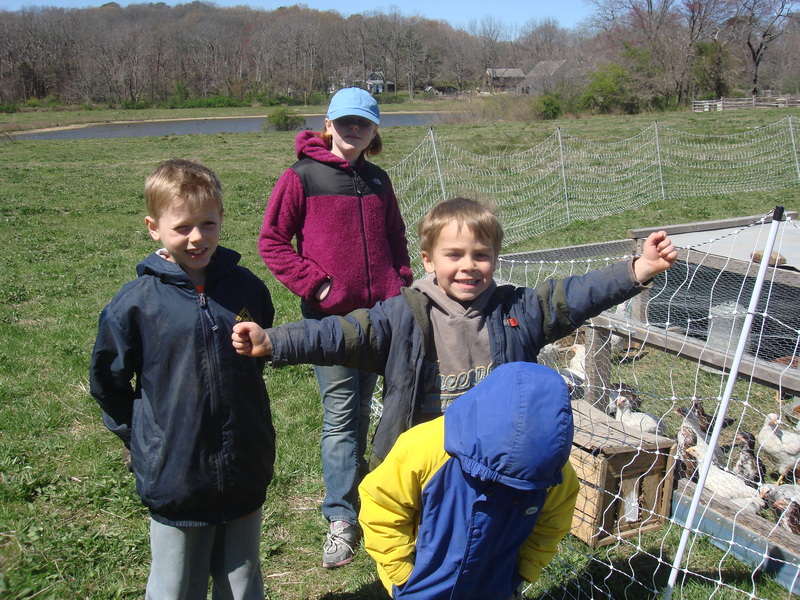 at Restoration Farm...behind them are two new features! To be fair, I have yet to truly investigate the situation — we’ll have to wait until the end of my semester for that. But I want to be armed and ready for action, should the need arise. And really, I just want to be involved with food. It’s not just about my kid. It’s about all of us. Since I didn’t even take pictures at the event (part of the self-flagellation on my circuitous route to the conference was realizing I forgot my camera) and I can’t seem to pull even a logo off the Small Farm Summit website, I am just going to reference some of the inspiring folks who spoke and provide links to the amazing things they do! 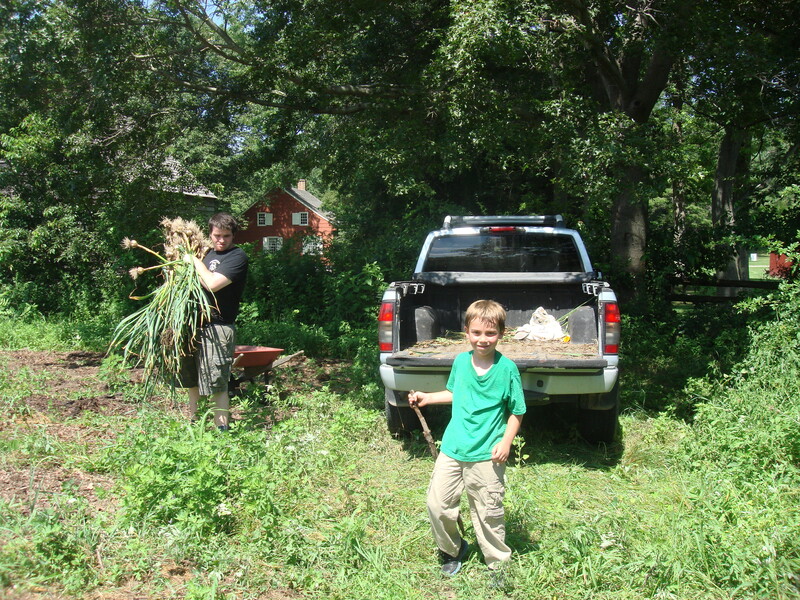 Former NBA player and son of sharecroppers, Will Allen and Growing Power are greening Milwaukee with intense urban farming that serves to feed people better, improve soil, reduce the waste stream and teach folks farming skills. Wow. Chef Ann Cooper The Renegade Lunch Lady has transformed the way many public school districts feed kids: no processed foods, no defrosted foods – just locally sourced, fresh ingredients and simple, kid-friendly good stuff. 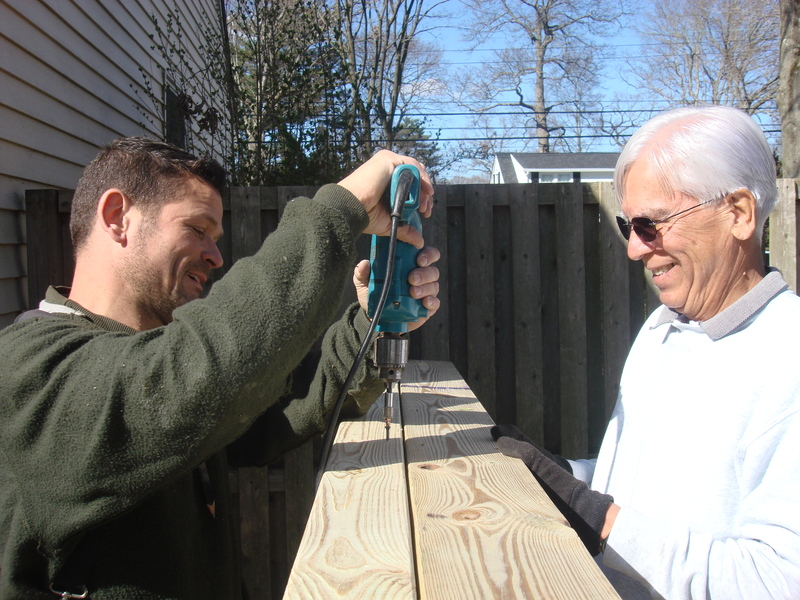 See how it can be done with the free tools at Lunch Box. Brooklyn Food Coalition‘s Beatriz Beckford helps schools and families learn to eat better from the grassroots (this is a terrible pun, I know, but sometimes I lack impulse control). They have a conference coming up…click on the link for more information! 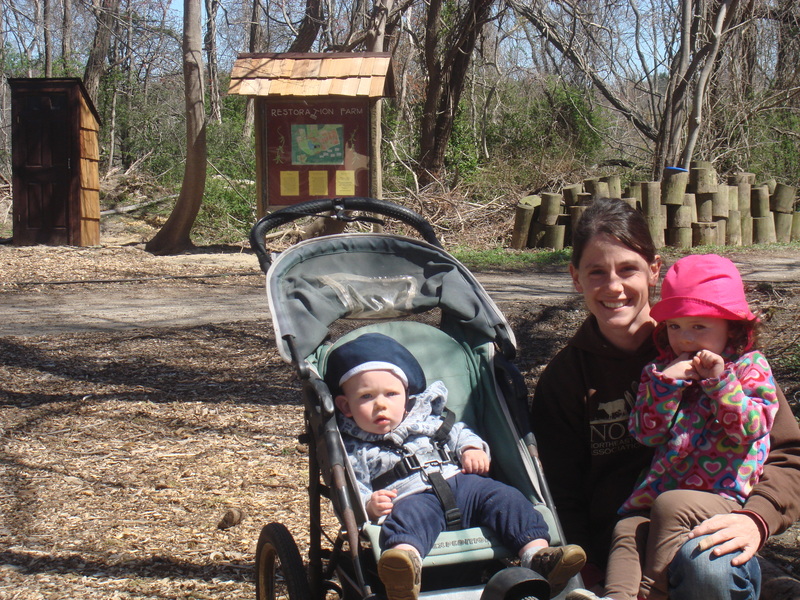 Leonore Russell is an educator at Crossroads Farm in Malverne, part of the Nassau County Land Trust. A former Waldorf teacher, she presented a lovely workshop on getting kids into the garden. We’ve been cuddling up with Peter Rabbit books ever since and I have to say, Leandro is very jazzed about doing the watering of the beds by himself. And Susan Simon, a social worker at the Hicksville School District, gave a terrific little presentation about how she got raised beds into her district. I got so many ideas about incorporating gardening into the curriculum from her!!! The beds before there was anything but seeds; I owe you pictures of our progess! HOW DO I FIND THE TIME?????????? So, the next day I planted some more vegetables with my dad in our new raised beds — OMG the beets are bursting through! — and resolved to dedicate my summer to gardening a lot and seeing what comes up. BTW – shout-out to Restoration Farm our CSA, and TWBarritt, a blogging and farming buddy who was ably manning the table and whose blog Culinary Types, is a personal favorite. 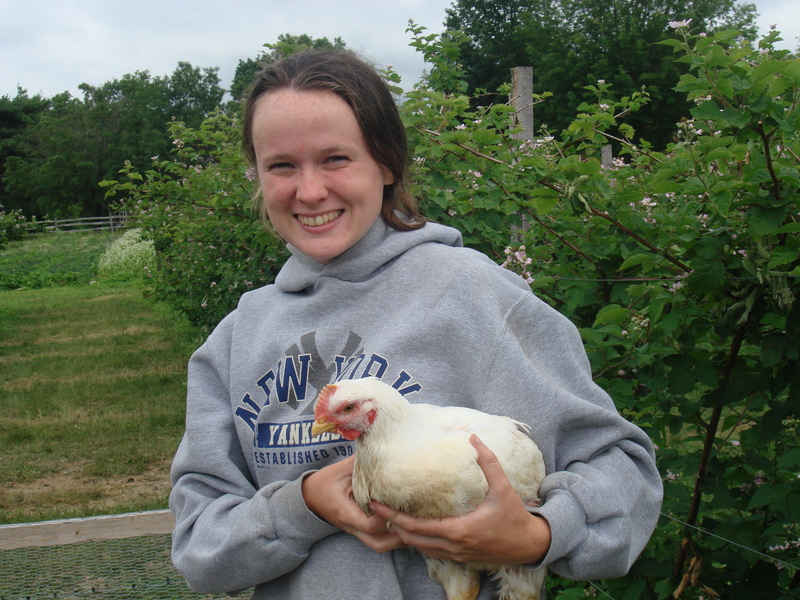 And to Donna Sinetar who I only saw through a conference hall window, but who presented on chickens after I had to leave! Let the (Gardening) Games Begin!!!!! I have my garden! I have my garden! My dad (Pedro) and I have been plotting (haha) to do some raised beds in our yard, now that some of the trees had to come down and there are a few sunny spots. 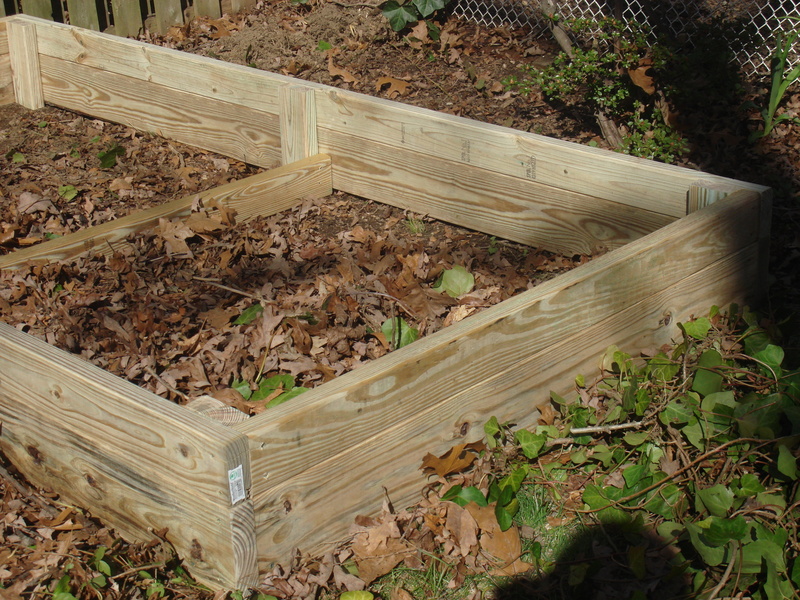 Last year I did some container gardening in those spots as a sort of reconnaissance mission and this week, Pedro and his buddy, Tommy, put together some raised beds from instructions from Organic Gardening magazine (April/May 2012). 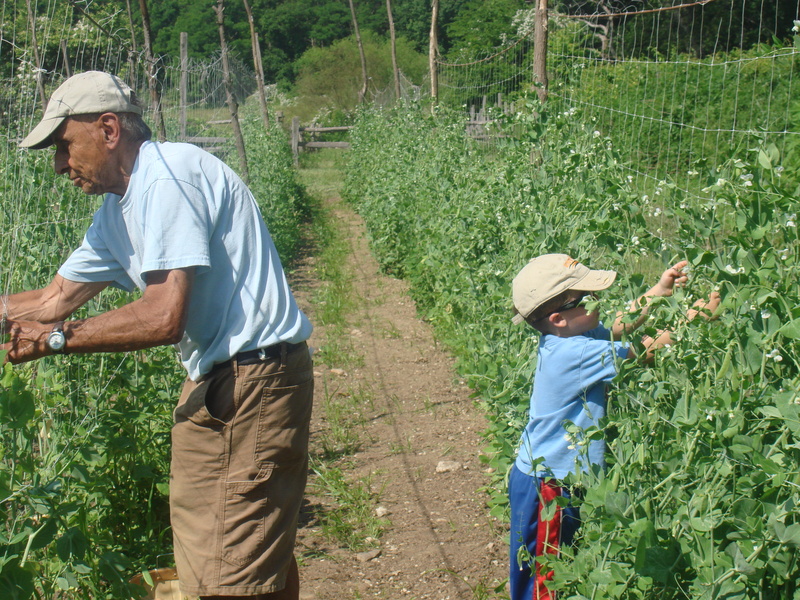 I can’t find a link to the instructions right now, but visit their Beginner’s Guide to Organic Farming and poke around in there and you’ll find loads of good info to get started. 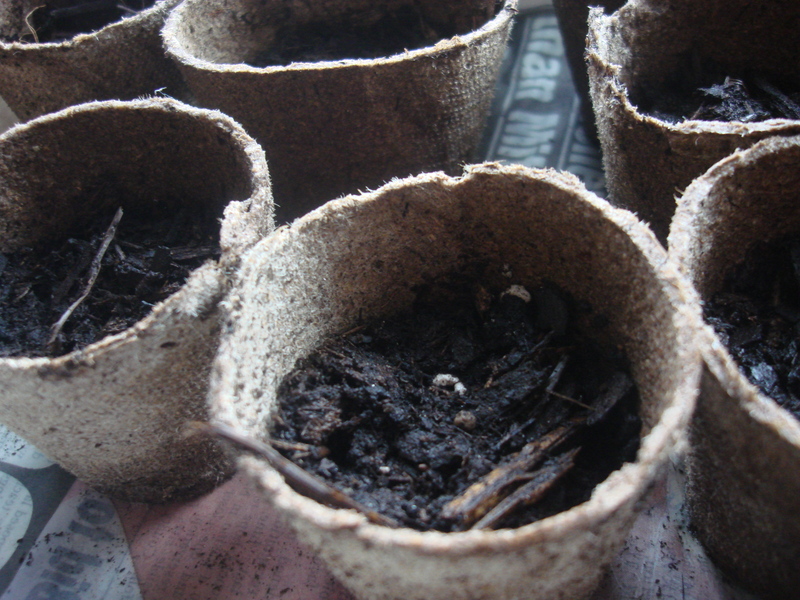 So, we made a garden chart and yesterday in went the pea seedlings (I had started some indoors and some outdoors a couple of weeks ago – you’re not supposed to start peas indoors, but we’ve done it before, with good results, plus it helps Leandro follow their progress more easily). 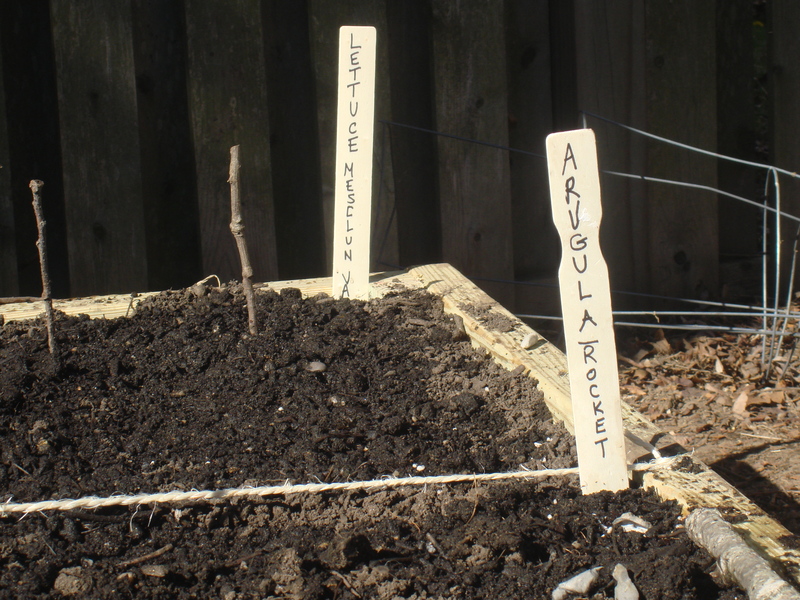 The mesclun lettuce and arugula seeds went in also. Today we’ll be stopping by a local nursery for more seeds, now that we have a plan: spinach, radish, beets, chard, and eggplant. We’ll be buying organic, as I mistrust the whole Genetically Modified thing and the chemical stuff. 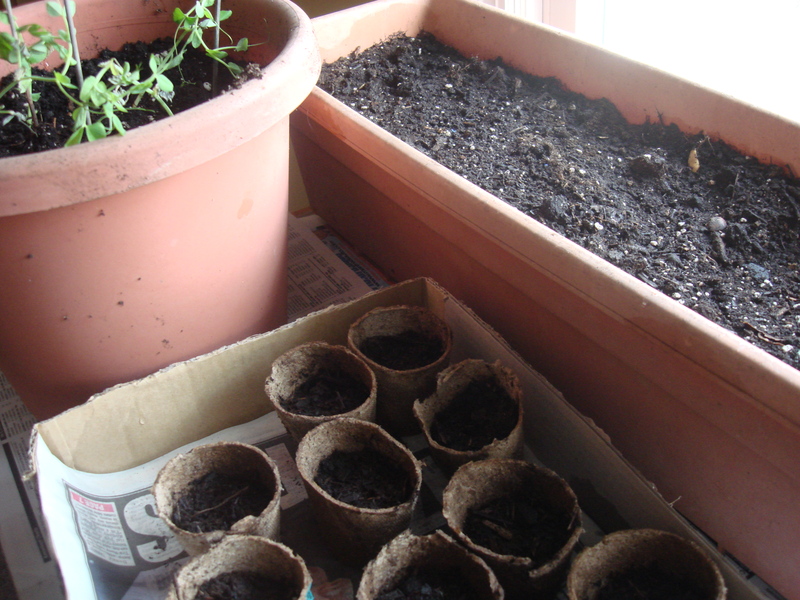 My tomato seedlings (seeds saved from last year’s tomatoes, aren’t I the little homesteader?) are looking well, but will stay indoors for now, as will the ají (sweet cooking pepper from P.R.) from my cousin Josie’s garden in Mayagüez. 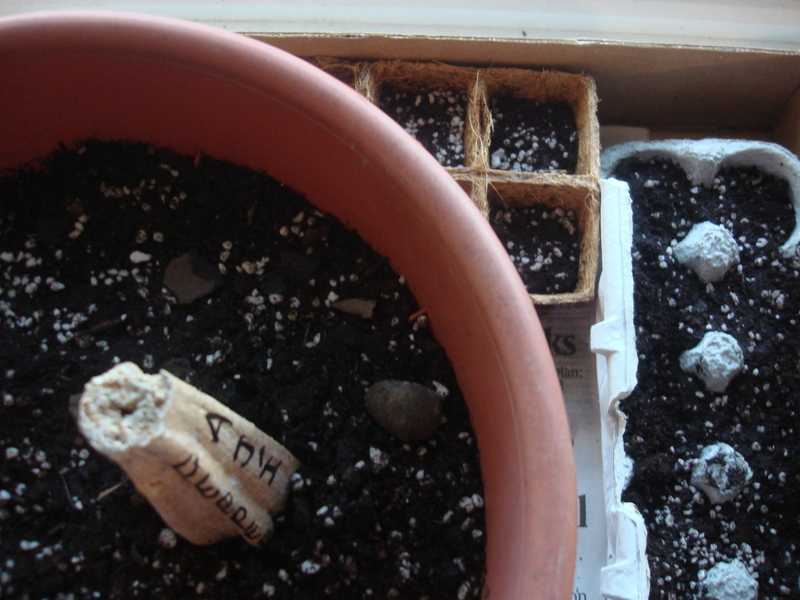 I’m starting basil from seed too – feeling really productive and busy and probably boring the hell out of you with my laundry list of planting, but so be it. 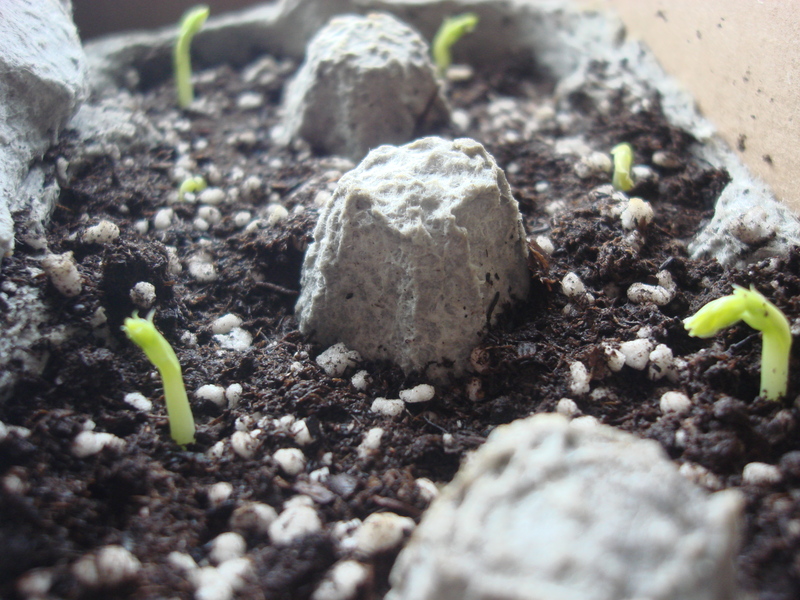 I am excited to finally be embarking on a vegetable gardening adventure! 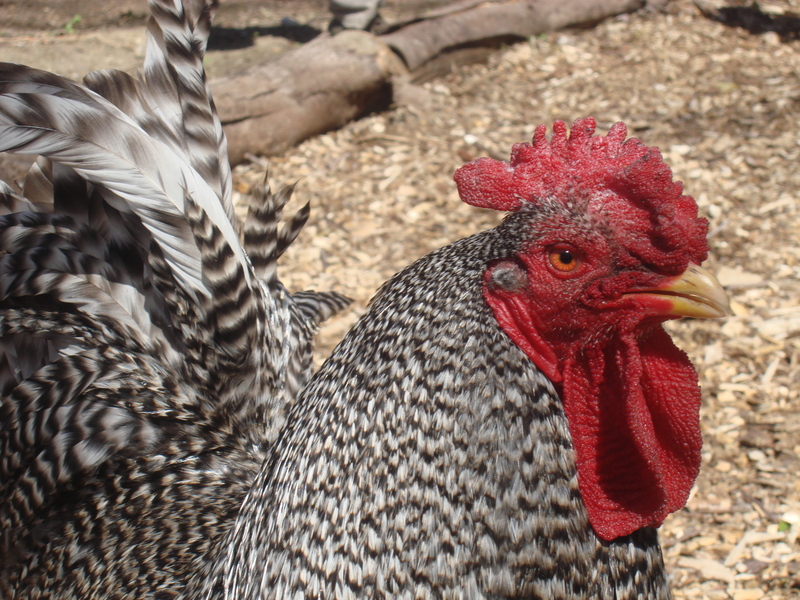 I am eager to know what you all are planting and planning for the summer months…I don’t really know what I am doing, but Pedro and I have agreed that this will be a year of more learning than producing (nice to have the Restoration Farm back-up, no?). Mind you, we are both demanding of ourselves, so that is perhaps not going to work out and we will agonize over every mistake, insect infestation, browned and spotted leaf or low yield…We’ll have to take good notes! Find out your growing zone here.